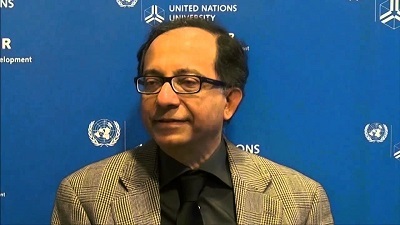 The 2003 Annual Lecture was given by Professor Kaushik Basu of Cornell University on the topic of ‘Global Labour Standards and Freedom of Choice’, and took place at Ritarihuone in Helsinki on 10 November. Kaushik Basu is known for the expert way in which he brings the tools of economic and philosophical analysis to bear on current development issues. In recent years his interests have included questions concerned with international labour standards and worker rights, particularly those related to the use of child labour in developing countries. As he points out at the start of the lecture, one of the less recognised consequences of globalization is an erosion of democracy, with the lives of individuals in developing nations becoming increasingly dependent on decisions taken in other countries over which they have no influence. The imposition of global labour standards—however well-meaning the motivation of the proponents—risks adding to this disenfranchisement as well as hurting the intended beneficiaries. Hence the need for a thorough assessment of the rationale for international intervention. Kaushik Basu is a professor of economics and the C. Marks Professor of International Studies in the Economics Department of Cornell University. Previously he taught at Princeton, MIT, and the LSE, and founded the Centre for Development Economics in Delhi. A Fellow of the Econometric Society and a recipient of the Mahalanobis Memorial Award, he is editor of Social Choice and Welfare, and has served on the editorial boards of the Journal of Development Economics and the World Bank Economic Review. He has published numerous articles and authored several books, including Analytical Development Economics, Prelude to Political Economy: A Study of the Social and Political Foundations of Economics, and Of People, of Places: Sketches from an Economist’s Notebook. The International Debt Problem: Could Someone Please Explain It to Me? Globalization, Poverty and Inequality: What Is the Relationship? What Can Be Done? Globalization, Poverty, and Inequality: What Is the Relationship? What Can Be Done?